This information and much more can be found in the Oliver Kids Team Manual. How to Choose 5-A-Day servings of fruits and vegetables! Be creative! It's easy to get the right amount of fruits and vegetables by making small additions to your everyday meals. If you have spaghetti for dinner, add some vegetables to the sauce. Add fruits, like berries to your breakfast cereal or oatmeal. Keep it interesting! Add hot-sauce, low-fat Ranch, salsa, or peanut butter to vegetables and low fat flavored yogurt to fruit for a different taste. Have more water & less sugary beverages! Carry a water bottle with you, that way you will always have water readily available. Keep cold water in the fridge so it's ready when you're thirsty. Add a slice of lemon, lime, orange or cucumber to water or even mix in a little bit of your favorite fruit juice. Choose sugar-free beverages and water. Don't keep sugary beverages around the house! If they're not there, you won't be tempted. When shopping for snacks make sure to look at the nutrition label for foods that are high in calcium and low in fat. Prepare healthy snacks in advance. Cut up fruits and vegetables and keep the servings in air-tight bags in the fridge, ready to grab and go. Make sure you pay attention to the serving size and have only one of them. Celery and apples with peanut butter are a quick and healthy snack. Low fat cottage cheese and peaches are a great snack because you get your needed protein and calcium from the cheese and all the nutrients of the fruit. Increase active play & decrease screen time! Try not to stay seated for more than 30 minutes at a time. Walk or ride your bike to school. When you're at home, instead of turning on the TV turn on some music and dance! Schedule after-dinner family walks three days a week. There are lots of activities that you can do at home without going outside. Do push-ups, do sit-ups, run up and down the stairs, play video games while standing up, lift weights (we have included tip cards for ways to stay active while at home). Choose 3-A-Day servings of low-fat dairy products! When having dairy products try to choose those with fat-free or low-fat milk. Make oatmeal with low-fat or skim milk instead of water. Milk is not the only way to get these servings. Cereal is simple, tasty, and easy. Pick a cereal with whole grains instead of lots of sugar. If you don't have time to sit down to breakfast, here are some tips for breakfast on the go... cereal bars, granola bars, yogurt smoothies, bagel with cream cheese, and orange or apple wedges. Remember to serve skim or low-fat milk. Serve a smart portion size! Use smaller bowls, plates, and cups. Do not go for seconds! But if you have to, choose to eat more fruits and vegetables. Eat your fruits and vegetables first, that way when you get to the other parts of the meal that may not be as healthy you will not overeat. Eat slowly, it takes 20 minute to feel full. 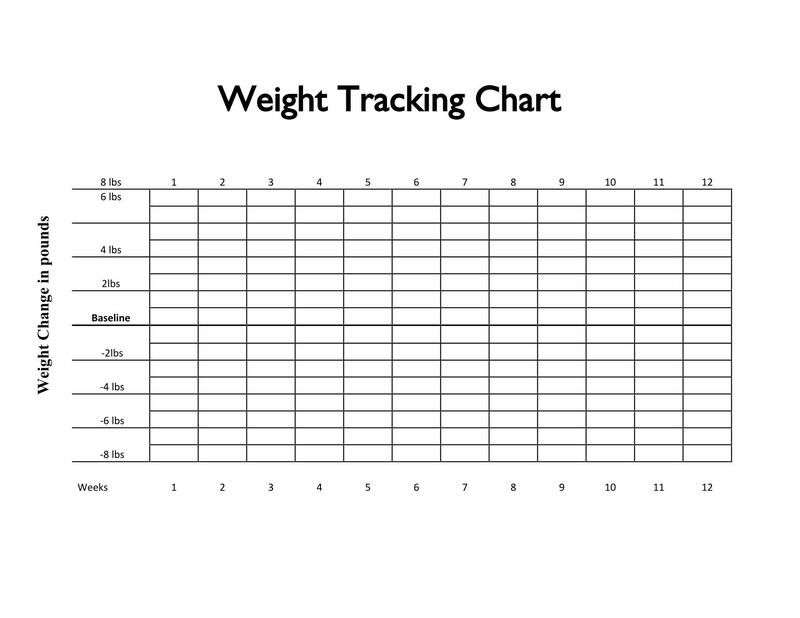 The following Weight Tracking Chart can be used to help individuals track their weight over a period of 12 weeks. It is a great tool to use as part of a staff wellness program. It will help in accomplishing each person's goal, whether they want to lose, gain, or maintain their weight. The first weight taken will be the baseline weight. After that each following weight will be marked according to the change from the baseline. 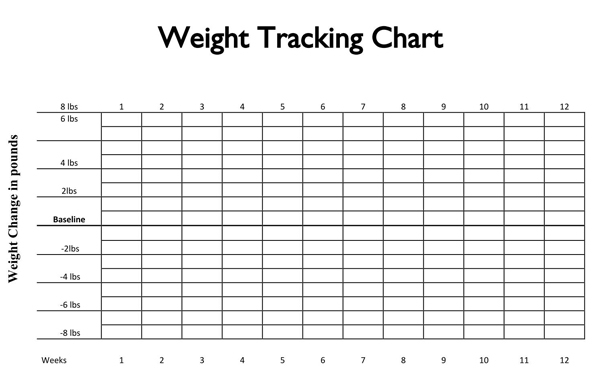 For example, if the baseline weight was 165 lbs., and the weight for week 8 is 160 lbs., it will be marked as -5 lbs. under week 8 because the change is -5 lbs. Staff can start a daily walking club; they can have one during lunch and one after school to make sure everyone gets the chance to attend. Staff can bring a change of clothes and either walk outside around the campus or even through the school halls. Many schools like to start the day with an "all school" walking club for those who arrive early. Staff can encourage each other to bring lunch from home at least 3 days of the week. To make this be an effective promotion, the packed lunches must also be healthy. A way to make everyone accountable for themselves is to have a show and tell of what everyone has brought to lunch. This will encourage staff to make healthier decisions. If the school has already set up the morning exercise program before school starts, all staff, teachers and students should make an effort to participate in the morning exercises. Staff sports teams are a great way to promote physical activity as well as a great team building strategy. Teams can be organized in various sports such as softball, basketball, volleyball, etc. The staff teams can compete against school teams, other schools or they can sign up a team at the local community centers. Many times, staff make it a habit to eat out for lunch and sometimes there is no other choice. For that reason, an effort should be made to make the best choice as to what restaurant to choose and what to order. To help with this choice, staff can have flyers posted in the teachers' lounge or in a booklet with nutrition information for all the restaurants in the area. Teachers can be provided with school water bottles which they can use on a daily basis in the classroom. This will increase their water consumption instead of choosing unhealthy alternatives and will also serve as a positive role models for the students. Ask the district Registered Dietitian to speak at a Faculty Meeting. He/She can help you plan the meeting to include healthy breakfast and lunch ideas. And the RD can help you plan your campus wellness plan as well. As part of your district wellness plan ask the Child Nutrition Department to review the snack policy. Healthy snacks available for both the teachers and students are a great way to role model healthy choices. Invite parents to a Health Night where they are taught the goals of the Oliver Kids TeamÂ® - to make healthy choices. It's the school's chance to show the work that they are putting into the program and motivates parents to help continue these goals at home. Organize a weeknight where students, teachers, and parents spend an hour or two at the park. All kinds of games can be played such as horseshoe, volleyball, Frisbee, kite-flying. It is just a fun night to encourage families to get out of their homes and be active. Fruits such as oranges, apples, and watermelon can be served as snacks, plus water - which the parents can volunteer to bring. Parents and students can be invited to an in-school "healthy" cooking demonstration where they can learn simple and nutritious ways of cooking. It also gives them a chance to try foods they have never cooked, which will expand the healthy foods they can choose. This event can be done on its own or it can be organized as part of another event such as a PTA/PTO meeting, an Open House, or any other school event such as Math Night, Science Night or Health Night. We have included a few recipes to help get this event going. You will need a chef/cook or parent that can do "healthy" food cooking demonstrations. We recommend a "sampling/tasting" of the food for the participants, thus you will need extra staff for this food preparation. Preplanning is essential for success. As a reward or just to have a health day, a Field Day can be organized. It can consist of a series of fun outdoor competitions, complete with an array of healthy snacks! We have provided a list of activities to help plan your school's field day. During the first five minutes of each day, students can do morning exercises to give them a little physical activity. Not only is this healthy for their bodies, but it will also wake up their brains and get them ready to learn! The school as a whole can do it together outside or via the intercom. If that's not possible the teachers can also organize exercise individually in their own classrooms. Check out the Tools section for songs and exercises that can be used to set up this activity. Why not exercise for 30 minutes after school and invite parents to join in. A walking club for teachers, students and parents can be organized. It can be an everyday activity or maybe just a few days out of the week. The walking can take place around the school track, playground, or basketball courts. It's a great way to get some exercise and to have a few one-on-one moments for kids and parents. Each month the cafeteria can promote one of the 7 healthy messages or CHOICES. To reinforce the benefits of choosing healthy foods (i.e. low fat dairy, water, fruits/vegetables, healthy snacks), students who choose and consume the chosen health food (fruit, water, etc.) receive a popsicle stick, which they are to turn into the cafeteria manager or teacher. Each day the sticks are counted and tallied up for each class. At the end of the set time frame (2-4 weeks) the class with highest count wins. The winning class can choose an activity (dancing, jump rope, basketball, etc.) to do for the next P.E. class period and can be labeled the "Healthiest Class". A picture of a "Balanced Tray" can be displayed in the cafeteria line. Every student that achieves the "Balanced Tray" can be given an extra incentive such as a sticker or small packet of Crystal Light for their water. Challenge the kids to eat breakfast at school; it will help them feel energized and ready to start the day. Promote the healthy choices specifically, like whole grain bread and cereals, fruits, skim milk, low-fat cottage cheese, low-fat yogurt and low-fat cheese. Challenge students to come up with suggestions of how to improve the nutritious and healthy options available in the cafeteria. And ask them to write a letter to the Child Nutrition Director with their suggestions. Just as students should strive for a "Balanced Tray" when in the cafeteria line, they should aim for a balanced lunch box. Teachers or cafeteria managers can check if students brought a well-balanced meal from home. To make it a competition, stickers can be given to students who achieve this and after a certain amount of time, the one with the most stickers can receive a prize, like a fun new lunch bag! Encourage students to go out and play once they are done with their lunch. An incentive to get students active can be to increase the lunch/recess time the students have by 5 or 10 minutes for every student being active throughout the period. Have a poster competition for that month's promotion, the winners' posters can be posted on the cafeteria walls and prizes such as water bottles or school gear can be given away. School events and meetings can also be turned into healthy environments. All it takes is some planning. Unless the events take place during a meal, try to avoid serving food and only have water and sugar-free beverages available. If snacks are preferred, fruit and vegetable platters are easy to serve. Another important thing to consider when planning the food for an event is the portion size. If at all possible, it is best to have pre-portioned foods so that attendees get the correct amount. Vegetable s- raw with fat-free dressing (Try blanching, or cooking in boiling water for 1 minute, then cooling with ice immediately. It brings out the color and natural sweetness of the vegetables.) Kids and adults like them this way. Students can wash cars and ask for donations. A great time to do this could be right after school when parents are picking up the students. A car washing area can be set-up on one-side of the parking lot to make it easy. Community partners can be asked to donate merchandise/gift cards that can be raffled. Also, to promote healthy eating a subscription to a fruit of the month club can be another raffle prize. Dances for the older students where tickets must be purchased to attend are a fun and fast way to fundraise and it promotes physical activity too! If a recycling program is not already in effect at the school, aluminum cans, paper and plastics can be recycled. Students can also be asked to bring in their recyclable materials from home, which would result in much more successful fundraiser. This is also a great activity to continue throughout the year with relative ease. Smencils are scented pencils made out of 100% recycled newspaper. Kids love them and there are many choices for fundraising, whether you want to sell them individually or in packs. More information can be found at www.smencils.com. Selling school spirit great is always a great choice and usually results in very successful fundraising. The spirit gear can include t-shirts, jackets, sweatshirts, water bottles, pens, pencils, key chains, etc. Parents can organize a Kids' Night Out once a month. In this event, a few parents volunteer to supervise the kids for four hours. The cost can be around $20 for the first child, $15 for the second and $10 for the third or whatever price your school decides. It can include a healthy snack for the children such as bananas and peanut butter with a glass of skim milk or sandwiches and fruit. The parents can organize games like Twister, dodge ball or story time for the younger ones. All the money goes directly to the school. The kids get to hang out with their friends. Parents get the night off without having to find a babysitter. A variety of donated items such as gift cards, healthy cookbooks, and tickets to events, as well as items made by the students and parents can be auctioned. A small event can be organized at the school where parents are invited to attend and bid on the items. Students can make recipe books in class and put them all together to make a large cookbook they can sell to family and friends. Students can be further involved by decorating it themselves. Students can be asked to draw one of the 7 healthy messages and they can be used as the pictures for each month. Parents will like the personal touch and healthy messages presented in them. The week of Valentine's Day, simple valentines with a carnation can be sold, which can be delivered on Valentine's Day. During their art class, students can easily make orange-clove Christmas decorations and they can be sold to families. They make great Christmas presents because they fill rooms with a great Christmas aroma. * Directions on how to make them are in the Art Activities section. The PTO or parents can provide water bottles to teachers throughout the year to sell to students. It can be instituted as a fundraiser for PTO and each water bottle can be sold for $.75 to $1.00.